I’m in a small 2 propeller plane from Stockholm, surrounded by a detachment of young soldiers. The guy in full military garb next to me is continuously solving and randomising his worn rubix cube for the entire 30-minute journey as I watch the archipelago below. That was my introduction to the Swedish island of Gotland, which has only recently been re-militarised. We land at a small airport outside the UNESCO World Heritage Site city of Visby where Baltic Art Center (BAC) is located. Walking out of the terminal I’m immediately confronted by a quaint medieval barn which I’m told was built purely for the tourists. The first few days are spent getting to know Visby and the staff of BAC, Helena and Anna. We chat about the ancient geological formation of the island and the abundant fossils, medieval buildings, Viking artefacts and mining pits that dot the landmass. On the third day, I meet with Helen Beltrame-Linné, the artistic director of the Bergman Centre, which is located on the northern island of Fårö. This is where Ingmar Bergman lived for over 40 years and where he shot 5 films and 2 documentaries. We discussed his legacy and the way the unique island served as a kind of muse. His obsession lead other filmmakers here, notably Andrei Tarkovsky who shot Offret (Sacrifice) in Närsholmen, south-east Gotland. Later in the week I met Paola Ciliberto from Film på Gotland over lunch in the BAC kitchen. She told me about how various film projects are supported through her organisation which has offices and a studio in Fårösund in the north. She also showed me a mobile app they have in development which charts the history of film and video production on the island, a great resource. I ended the week venturing down the coast to the Högklint nature reserve for a walk along the cliffs in extremely windy conditions. My first days here have got me thinking about time on a deep ecological and geological timescale. The problematics of our current crisis, where the Earth’s system dynamics is absorbing the effects of our human influence, is evident. Might it be useful to think as an island: a brain whose agency comes from the vibrancy of its contained ecosystem. My second week at Baltic Art Center was spent laying ground work by diving into the deep history of this island. The first stop was the Gotland Museum in Visby. Here, the display is split over three levels and charts important periods in the island’s past starting with its ancient formation from sedimentary deposits during the Silurian age (443.8–419.2 million years ago) when the landmass was situated on the equator. Rooms cover topics including: the Bronze and Iron ages; Viking age; Hanseatic League; conversion to Christianity; civil war; and the bloody Danish invasion by Valdemar Atterdag in 1361. 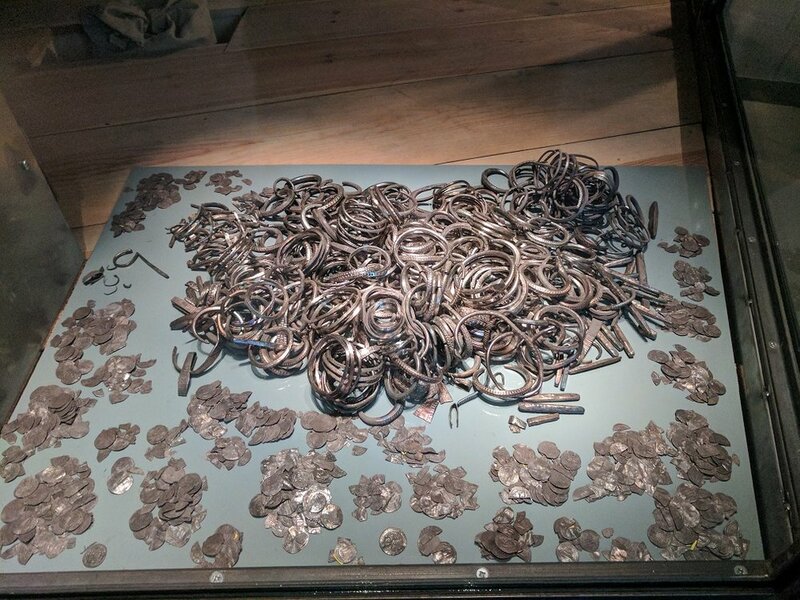 Housed in the museum is the Spillings Hoard – the world’s largest Viking treasure find unearthed in 1999 – which consists of 67 kg of silver and 20 kg of bronze artefacts. Among the silver items are about 14,000 coins, mostly Islamic, which show the expansive trade routes of the time. There is whole room devoted to Viking picture stones, giant stone slabs filled with symbolic engravings that scattered the island as memorials to the dead. 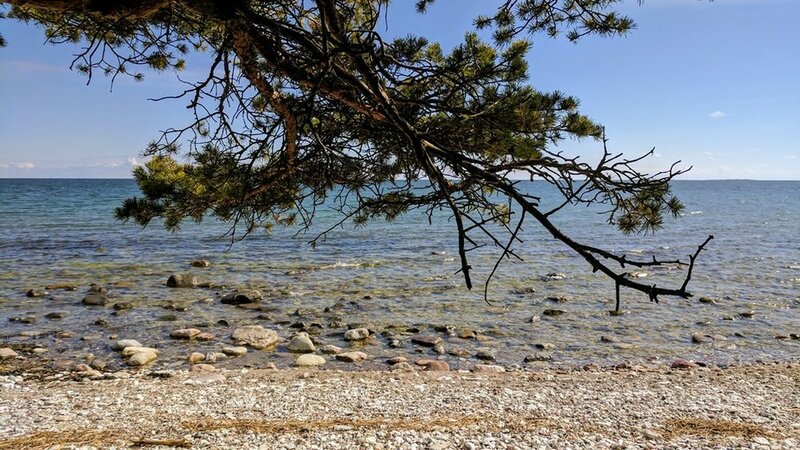 The next day, after joining the local library and checking out a number of books on Gotland I started exploring the coastline immediately south of Visby. I took a long walk through the nature reserve Södra Hällarna, down the cliffs and along the pebble beach below. 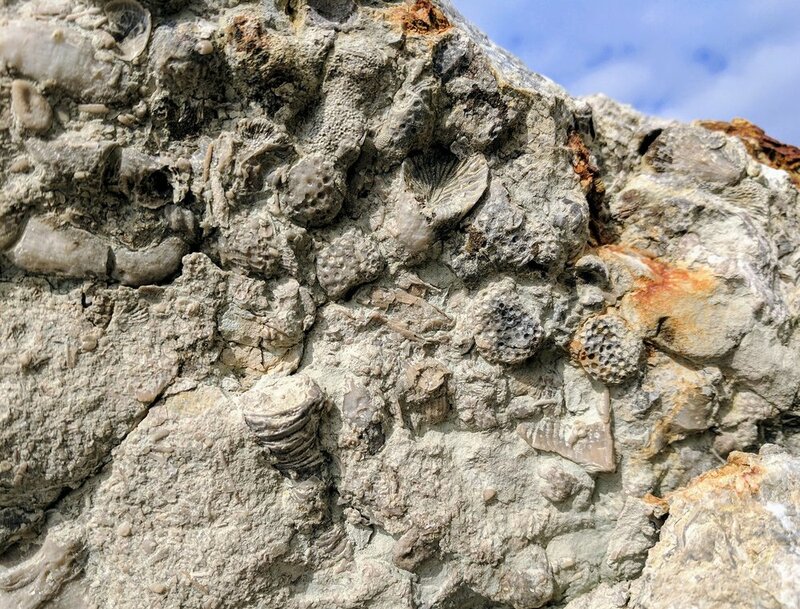 Inspired by the fossil displays at the museum and talking to Anna at the residency (herself an ardent fossil hunter and collector), I decided to devote the rest of the week to exploring some of the most fossiliferous parts of the island. I started at Rövar Liljas håla, a cliff face named after a famous 18th century felon where huge section of the bluish-grey marlstone cliff has broken away and large boulders litter the shoreline. Within these boulders, thousands of fossils stuck, exposing the history of life millions of years ago. Next, I drive about 35 minutes north to Ireviken and later, to the small fishing village of Lickershamn. Here I walk down the coast past Jungfrun (The Maiden), the tallest seastack on the island, and stumble across the Stuklint WWII bunker high up on the cliffs. 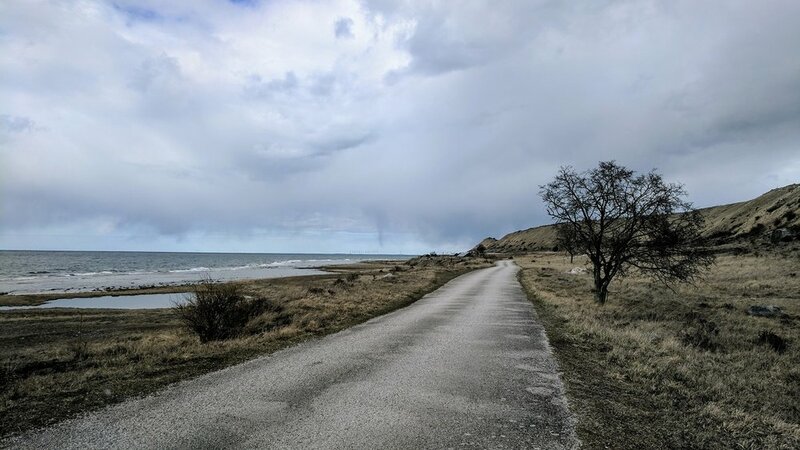 As I swung around the half way point of my time on Gotland I started to drive further outward from my central Visby vantage. The landscapes moved under my feet and past the windows of the little BAC van, droving under extreme opposites: bright sunshine and heavy snow storms. Easter brought quiet to the BAC building with Helena and Anna both on holiday. But by contrast there were more and more tourists on the island, not enough to make a true difference, but I glimpsed some of the madness of summer when I’m told around half a million people swarm here. On the Thursday before Easter, it’s a local tradition to march through the streets dressed as witches, donning headscarves and painting on freckled rosy cheeks. I went out to watch some of the estimated 5,000 people walk down the cobbled streets to the park near the university at the bottom of town. I drove up to Snäck to discover a Brutalist looking apartment building facing the sea. A few tourists on mopeds snapped pics of the view and the limestone cliffs loomed overhead. The beach and swimming peers, obviously summer attractions, were desolate and closed up. About 15 minutes inland I strolled around one of the few mines that has been turned into a public swimming pool. Again, there were no signs of people and it was hard to tell if the mine was actually back in action. At the end of the long weekend I ventured south east to the opposite coast, my first time on that side of the island. 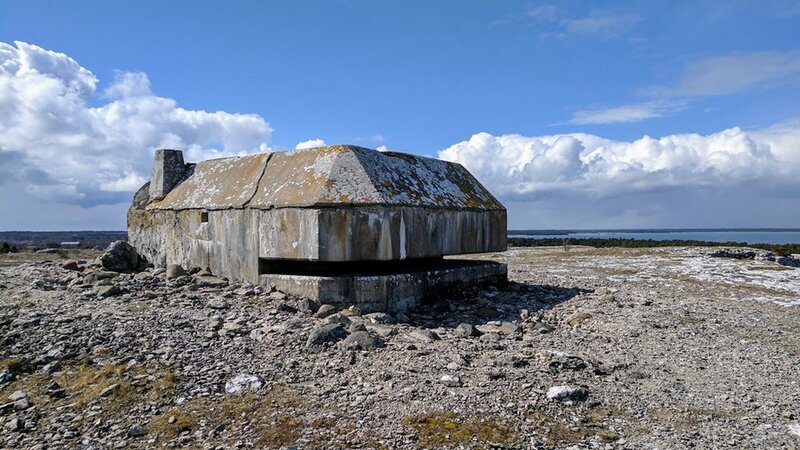 I found an old limestone kiln next to a disused mine and walked along the coast at Sysne and Grogarnsberget nature reserve, looking for fossils and passing three different WWII bunkers. 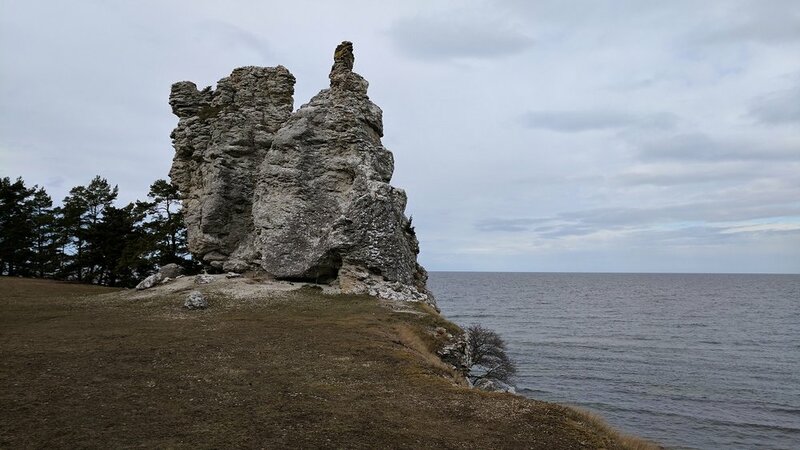 At Folhammar there is a large cluster of limestone ‘sea-stacks’ which the Gotlanders call rauks, these ancient geological formations rise at various points along the coastline. On the drive home I stopped at Gålrum Viking grave field where boat shaped groups of boulders outline the old grave sites. Archaeologists, a cultural geographer, a stone carver, quarry workers, tourists and the caretaker of Ingmar Bergman’s estate. These are a few of the people I’ve met over the past week which has been packed with field trips to all corners of Gotland, from Fårö in the north to Hoburgsgubben (Old Man Hoburg) at the southern most tip. 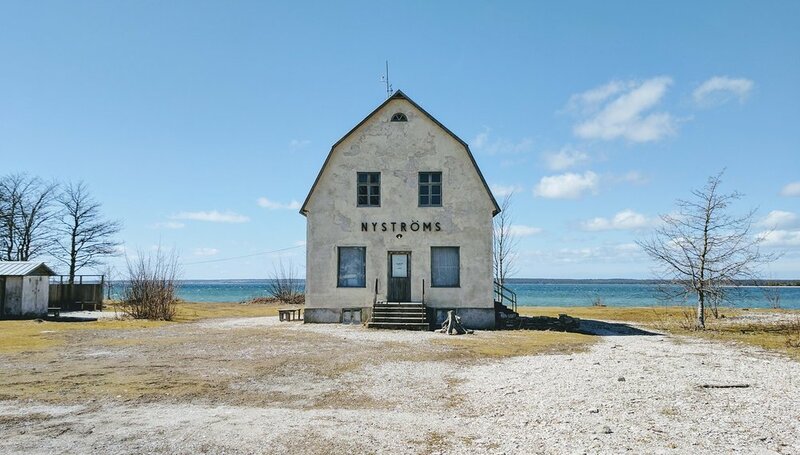 At start of the week, Helena from Baltic Art Center and I drove up to visit the film studios at Fårösund and onwards to the island of Fårö which is connected by a short car ferry. Here, the Swedish film director Ingmar Bergman lived for 40 years and he made four films, two documentaries and a TV series on the island. We were given a guided tour of the locations from Through a Glass Darkly (1960) and Persona (1966), his purpose-built cinema, his grave, and finally the house he built in Hammars. A few days later I set out to the farthest southerly point of Hoburg where a rock formation is said to resemble an old man (only when seen from the perfect angle). On the way there, on the East coast of the Sundre peninsula, I turned the corner of a small dusty road to be greeted by two young soldiers with machine guns. I was ushered to stop and rolled down my window. They informed me that it would be “not recommended” to continue this way as they were running military exercises with high levels of radiation. After a well scrutinised five-point-turn in the narrow road I skirted the site. Later in the day I noticed a helicopter flying manoeuvres overhead. Twice this week I went to the university campus to meet with a geographer and an archaeologist. They both spent time with me offering their unique views on Gotland and its history. The geographer, Tom, had lots to say about how the natural resources have been circulated and traded. Along with the limestone, he spoke of the forest and the water as resources that have been manipulated. The stone cannot be seen in isolation, but is part of a broader ecosystem. At the end of the week I spent a great day traversing the north. Starting at 7am at a stone workshop where massive chucks of limestone were being sliced into floor stones. With a local stone carver as my guide, I was shown two of the active quarries where they now use giant saws to cut down into the stone, but in the past, they used to drill thousands of holes and then crack it apart from the top in a much slower process. Afterwards, I went across to the former military peninsula of Bungenäs which is now owned by one person. The landmass has restricted vehicle access and the massive quarrying is evident in the steep cliffs and small lakes that have formed beneath. The spot is now dotted with expensive summer homes and modern conversions of old bunkers. Lastly, I visited a small island connected by a short bridge, called Furillen. This as well was a former quarry and the old buildings show the immense scale of the former industry. The buildings, of course, now form part of a luxury hotel. The last week at Baltic Arts Center was spent ticking of the final few boxes on my list of sites compiled throughout the residency. Completing my tour of all corners of Gotland I spent a day with a growing number of tourists on Fårö to the north. After a couple of hours in the car I reached the top where a famous lighthouse keeps watch over the pebbled coast. The stones here were packed with fossils and a group of bird watchers had set up camp with their expensive looking telephoto binoculars. The famous rocks at XXXXXX were next, and in contrast to the deserted sites and empty parking lots a month ago, there were families having picnics, groups driving remote control cars, and a tour bus. I drove south down the west coast and stopped in at the ruins of St. Olaf's Church (now just a rectangular foundation) who is credited with bringing Christianity to the island. Here a small inland lake is evidence of a former trading harbour. Later in the week, I took an excellent guided visit of Brucebo, the house that Canadian painter W and Swedish sculptor built in 1900, that is now runs a residency programme. Betraying the former owners particular early 19th century fascination with collections of curiosities, I was shown a disorderly collection of small rock samples, seemingly from around the world, placed in little open boxes and piled into one side of an old wardrobe. As things that the wealthy couple had accumulated, the collection held a mystery whose only clues were in held some scrawled notes of paper stuffed beneath the stones. The two who run the space said that they'd translate it for me and I look forward to seeing what answers are written there. After reading her book about Gotland's geological formation, I organised to meet with Sara Eliason, a local paeleontologist and Gotland's resident fossil expert. We had a great chat and I was particularly interested to hear her concern over how the natural habitats of the island are being threatened by increased limestone mining. 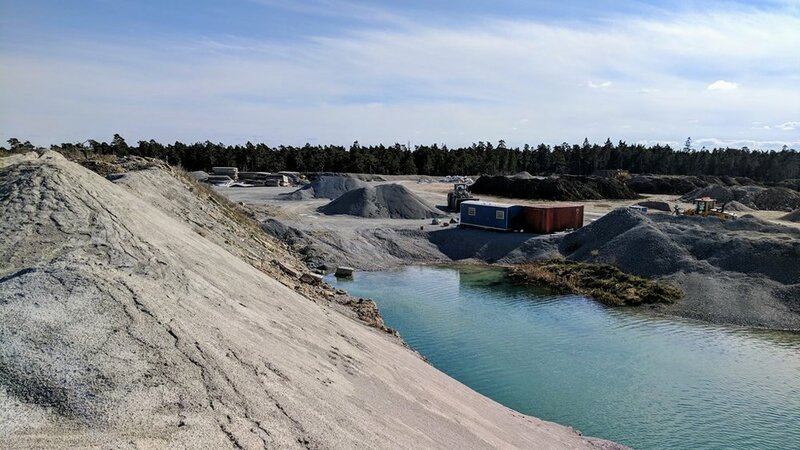 There are three big mining companies on Gotland each with slightly different agendas. 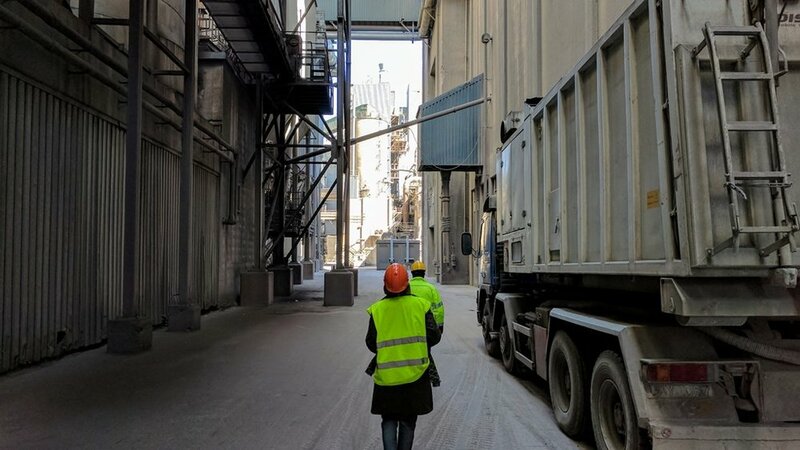 On my last day, BAC organised that Helena and I would tour the factory of Cementa, one of these big three, whose mining activities support the production of, unsurprisingly, cement. During the two-and-a-half-hour tour we were lead through the enormous facility which runs 24 hours a day. Pretty much all the machines are automated and there were very few people about, even the central control room had just a couple people sitting behind massive arrays of dusty monitors. They explained to us how the energy sources are slowly moving from oil and coal to recycled rubber, plastic and textiles (among others). But the exhaust fumes still pump huge quantities of CO2 into the atmosphere as a product of burning the limestone. On the bumpy flight off the island, I have a sense of the island as a living force. I'm leaving behind a powerful entity, but one that's being deconstructed. Millions of years ago, sediments that circulated at the equator constructed the reef mass that became Gotland. Now those raw materials are being radically dispersed.